With its latest masterpiece, CENTURY continues to appeal to the self-assured, conquering man. Sublimely masculine, the PRIME TIME CHRONOGRAPH EGOS DAY & DATE embodies power and strength. True to the spirit of the ESQUIRE collection, the new PRIME TIME EGOS CHRONOGRAPH combines the proven good looks of a dodecagonal case with the timeless character of CENTURY sapphire. This exceptional timepiece exudes solidity and elegance. The robust case, water-resistant to 100 metres, is made from a hand cut, hand polished CENTURY sapphire: a scratch proof, inalterable material that retains its flawless appearance, day after day, year after year. The PRIME TIME EGOS CHRONOGRAPH DAY & DATE is equipped with a COSC-certified self-winding mechanical movement with 48-hour power reserve. Its transparent back allows glimpses of the ensemble of bridges, plate and oscillating weight. The chronograph function is accompanied by a central second hand and three off-centre counters showing the hours, minutes and seconds. With complete mastery over the time and days that pass, the PRIME TIME EGOS CHRONOGRAPH DAY & DATE also features a day and date indicator that functions using a disc system. Around the rim of the dial is the tachometer scale in kilometres per hour, which can be used to measure average speeds. The timer is highlighted with a vibrant touch of red. Celebrating the number that symbolises balance, infinity and prosperity, the anthracite model features an oversized figure eight, a lucky number found in many sports and games of strategy. Al2O3 The signature CENTURY sapphire is a jewel of eternal beauty whose facets have been hand cut and polished by our master craftsmen. Ref. 606.4.D.50D.19.15D.VYM Steel back with dodecagonal case in CENTURY black sapphire with 12 facets cut and polished by hand. 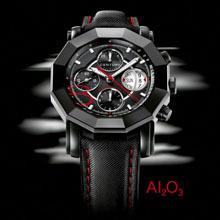 Black dial with red oversized 8. Self-winding mechanical movement, COSC-certified chronometer. Black canvas strap with deployment clasp.